When aiming for a lighter skin tone, you should limit your skin's exposure to direct UV rays of the sun. This doesn't mean that you completely avoid the sun for doing so will limit the amount of Vitamin D your body is exposed to. (Vitamin D is important for maintaining healthy bones as well as in the growth and repair of body cells). Hence, the most ideal way of limiting your skin's exposure to the sun is by using sunscreen. Since skin lightening products makes the skin more photosensitive, while using them, desist from exposing your skin to direct sunlight. Failure to do so will see your skin become more pigmented as the body (melanin) will be trying to naturally protect it from the sun. 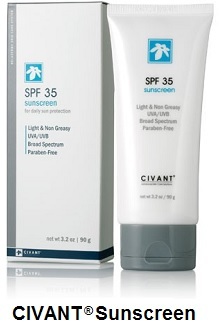 Therefore, always use a good broad spectrum sunscreen while using skin lighteners. ​The best way of using skin lighteners with sunscreen is by first applying a skin lightener, such as MELADERM on the skin and, waiting for up to 10 minutes before applying your sunscreen and makeup. This ensures that the lightening cream get absorbed by the skin and, prevents the sunscreen from reacting with it. Then, when choosing a sunscreen, only go for one that is capable of blocking both the UVB and the UVA rays. This is because of the three types of UV rays (UVA, UVB and UVC), two are dangerous. According to the Skin Cancer Foundation, UVA and the UVB rays are responsible for skin photo aging and tanning. Compared to UVB rays, UVA rays are less intense but more prevalent. They also have higher abilities to penetrate deep into the skin. These are indeed what are responsible for causing wrinkles and aging. On the other hand, UVB rays are more intense hence are usually the ones behind skin reddening and occurrence of sunburns. In worse cases, they may cause damage to the upper epidermal layers hence leading to skin cancer. In a nutshell, since MELADERM has exfoliating powers too, it should be used at all times with a sun block. Moreover, using a skin-friendly, Non-oily sunscreen while using this lightening cream will help get rid of any sun-related damage to the skin while avoiding the build up of acne on the face due to excessive oil.